Most contenders didn’t get a shot at some of the biggest bats to hit the waiver wire. Earlier this week the Twins placed two desirable hitters, Jim Thome and Jason Kubel, on trade waivers, and both were claimed by teams on the fringe of contention. Kubel will stay put, while Thome heads to Cleveland. Left in the dust were teams such as the Angels, Rangers, Yankees, Red Sox, Tigers, and the entire National League. Yet if any of these teams want to add a left-handed bench hitter there is one readily available. 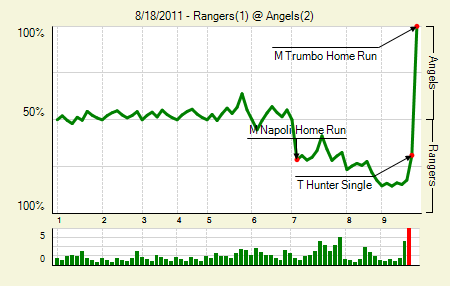 Moving the Needle: Coco Crisp’s three-run homer in the 10th gives the A’s a convincing lead, +.483 WPA. Crisp started the game right when he homered in the first. 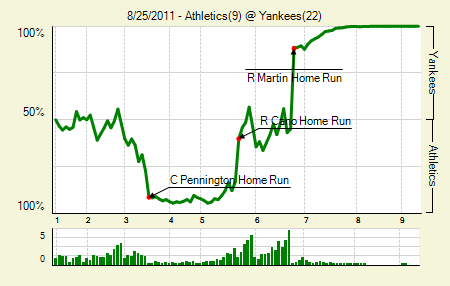 The Yankees, of course, covered that run, and eventually took the lead. 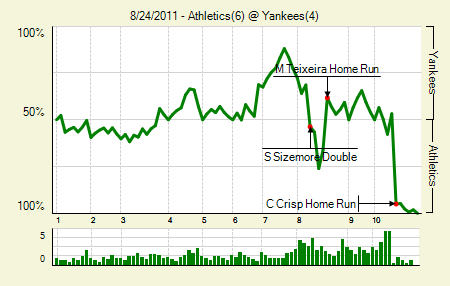 But CC Sabathia had some trouble in the eighth and allowed the tying run to score. 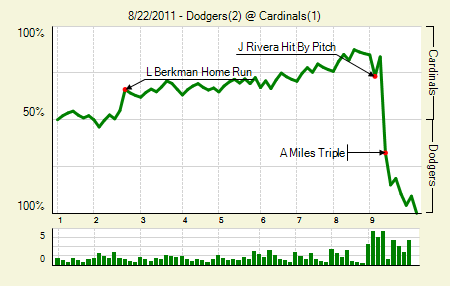 Each team scored one more, bringing the game to extra innings. The A’s singled twice, and then Crisp hit a monster shot to right, into the second deck. The homer gave the A’s all the lead they’d need, even though the Yanks did manage to put up another run in the 10th. Nick Swisher: 2 for 3, 2 HR, 1 BB. He also hit a homer in the previous game, and came within about two feet of a walk-off grand slam in that one. Scott Sizemore: 4 for 4, 2 2B. He and Crisp combined for perfect days. Moving the Needle: Aaron Miles ties the game with a triple in the ninth, +.514 WPA. It appeared as though Lance Berkman‘s second inning homer would hold up, as the Cardinals held that 1-0 lead into the ninth. But their bullpen could not hold it. Miles drove in the tying run with his triple, and Rod Barajas followed with an RBI ground out to give them the lead. Javy Guerra picked up the save, though facing Corey Patterson in Matt Holliday’s stead helped plenty. Chris Carpenter: 8 IP, 5 H, 1 R, 1 BB, 7 K. It was all going so well until he plunked the leadoff hitter in the ninth. James Loney: 3 for 3. They were all singles, yes, but that’s still seven hits in his last two games. 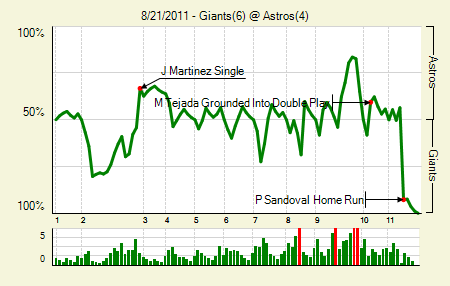 Moving the Needle: Pablo Sandoval’s two-run homer puts the Giants ahead in the 11th, +.492 WPA. The Giants tied the game at four in the fourth, and then waited seven more innings to score another run. 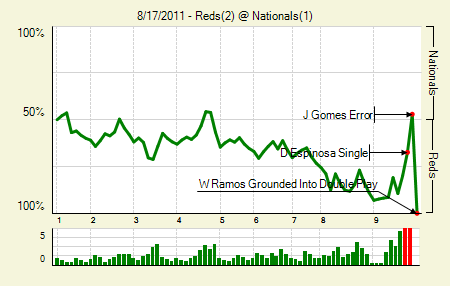 Both teams threatened in the ninth, loading the bases, but neither came through. In the 11th the Giants got a one-out walk, and then two batters later Sandoval blasted them to victory. Ramon Ramirez, filling in for the injured Brian Wilson, pitched a perfect bottom half. J.D. Martinez: 3 for 5, 1 2B. He drove in two runs. J.D. Martin, on the other hand, is … I have no idea. Brandon Belt: 4 for 5, 1 HR. He drove in three. Aubrey Huff should be getting the Aaron Rowand treatment soon enough.